The George Soros-funded Clinton front-group Think Progress expressed disappointment Sunday that conservative journalists who attended a dinner party with Barack Obama a few weeks ago haven't abandoned their political principles and become bleeding-heart liberals. "CNBC Reports" host Larry Kudlow believes free-market capitalism is the best path to prosperity. Too bad CNN "Lou Dobbs Tonight" host Lou Dobbs doesn't. Dobbs attacked Kudlow during the Jan. 14 broadcast of "Lou Dobbs Tonight" for commenting on a dinner meeting of conservative pundits at the home of Washington Post columnist George Will on Jan. 13. Kudlow was not included in person or by phone to respond to Dobbs' criticism. "This is Larry Kudlow - one of the folks invited to a conservative fest with the president-elect last night," Dobbs said. "I'd like to just share, everybody - what a Larry Kudlow-conservative person does after meeting with the president-elect." Dobbs cited a few lines from Kudlow's appearance on CNBC's Jan. 14 "The Call" - "He is charming, he is terribly smart, bright, well informed. He has a great sense of humor." Then Dobbs skipped moments in Kudlow's exchange with "The Call" co-host Melissa Francis and added - "He's so well informed and he loves to deal with both sides of an issue." In today's "You've Got To Be Kidding Me" moment, PBS's Jim Lehrer actually defended the corrupt actions of Illinois Governor Rod Blagojevich Friday asking his guests, "What's the big deal here?" I'm guessing that Paul Krugman and David Brooks don't hang out that much together. So when both turn up on the New York Times op-ed page this morning with columns calling for massive government spending, I'm assuming they came to their conclusions independently. My working hypothesis: if Krugman and Brooks agree on something this important, they must be wrong. 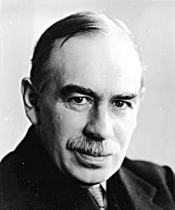 [W]hat the economy needs now is something to take the place of retrenching consumers. That means a major fiscal stimulus. And this time the stimulus should take the form of actual government spending rather than rebate checks that consumers probably wouldn’t spend. Let’s hope, then, that Congress gets to work on a package to rescue the economy as soon as the election is behind us. Financial Times reporter Edward Luce has found another sign of trouble for the McCain campaign: he's turning up the noses of the "cocktail party circuit" inside Washington, D.C., which is "swelling with disaffected Republicans." The more trouble John McCain's campaign encounters, the more it highlights the cultural divide between the "real America" the Republican candidate says he represents and the Washington "cocktail party circuit" that largely disdains it. That circuit is swelling with disaffected Republicans. Some complain about Mr McCain's selection of Sarah Palin, whose appeal to "Joe Six-Pack" may have been dented by revelations this week that she has spent more than $150,000 (€117,000, £93,000) of other people's money on her wardrobe. Others are upset at the negative tone of the campaign. David Brooks, the "House Conservative" of the New York Times, should seriously consider putting his self-description as "conservative" in quotes at all times in order to comply with truth in packaging. I mean how conservative can you be when liberal sources are quoting you favorably, especially when you sound like, without quite saying so, you are endorsing Barack Obama? David Brooks on Obama: Redwood Forest or Sturdy Mountain? To put more evidence on the bone of contention that PBS was really slanted after the debate last night, I have fuller transcripts of what transpired. 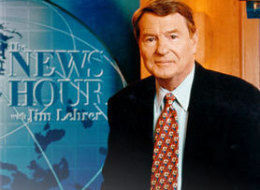 On the Jim Lehrer post-debate show, as the candidates were still on stage waving goodbye, anchorman Jim Lehrer asked David Brooks "Did McCain do what he had to do?" During Wednesday’s Newsroom program, CNN anchor Rick Sanchez tried to portray that there were many so-called conservatives who were "defecting," in his words, from John McCain over his selection of Alaska Governor Sarah Palin as his running mate. His list of conservatives, which he read prior to an interview of National Review senior editor Ramesh Ponnuru, included homosexual activist Andrew Sullivan, New York Times columnist David Brooks, and satirist Christopher Buckley, who recently left National Review over his endorsement of Barack Obama. Sanchez later backtracked from this labeling after Ponnuru pointed out that "a lot of those people who are critical of Palin are not defecting from McCain:" "I'll take it back. Let's take out the word ‘defection,’ and just say Republicans who have been critical of John McCain. Is that more fair?" The Huffington Post reported that New York Times columnist David Brooks, the man PBS’s "NewsHour" unit selected to represent in some way "conservative" opinion in America, has condemned Gov. Sarah Palin as "a fatal cancer to the Republican Party." 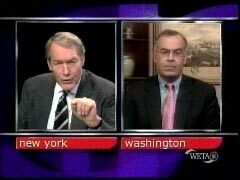 Brooks claimed some conservatives not only scorn liberal ideas, but "scorn ideas entirely," including Palin and President Bush. He also lauded Barack Obama’s intellect, recounting a conversation he had with Obama about the intellectual Reinhold Niebuhr: "I was dazzled, I felt the tingle up my knee as Chris Matthews would say." Many conservative and Republican taxpayers might ask: why are our tax dollars going to Washington to fund PBS, while they select "conservatives" to represent us who hate the politicians we support, and blithely sit around with liberals at pricey restaurants like Le Cirque and complain that those hicks from Texas and Alaska aren’t reading enough Niebuhr? Are we going to go to the polls to elect a commander in chief, or a senior fellow in Niebuhr studies? A week-and-half before he'll moderate the third and final presidential debate, CBS's Bob Schieffer opened Sunday's Face the Nation by calling a foul on one team as he took sides and denounced Sarah Palin's daring to say, that “our opponent is someone who sees America as imperfect enough to pal around with terrorists who targeted their own country,” as a sign of “a campaign that's turned down and dirty,” as well as “nasty,” thanks to John McCain's “new attack dog” who “took after Barack Obama in a style reminiscent of Spiro Agnew when he was Richard Nixon's running mate.” In the Washington press corps, a comparison to Agnew is no compliment. A few days ago, columnist Kathleen Parker outraged many conservatives with a column suggesting Sarah Palin should resign her vice-presidential nomination because she's clearly out of her league: "If BS were currency, Palin could bail out Wall Street herself." Parker's outraged that someone would suggest she's not conservative.